REAPER themes can be stored in a .zip file (and named .ReaperThemeZip) for distribution, but for development purposes they usually exist as a combination of files and a directory. Default_5.0_unpacked.ReaperTheme -- this is the theme file which is selectable in REAPER's UI, and it controls the colors and fonts used by a lot of the user interface, including the arrange view and ruler, as well as the path to the images which should be loaded. This file is a text file which you can edit by hand, or for many edits it is easier to do on the fly, by using the action "Theme Development: Show theme tweak/configuration window" in REAPER. The main line which will often need to be edited by hand is the line "ui_img=" in the [REAPER] section, which controls which folder to use theme images from. Default_5.0_unpacked -- (a directory) This directory includes many images which will be loaded, and a special file named "rtconfig.txt"
tcp_voltext_flags flag maxlen ; flag for volume strings: set 1 for no-dB, 2 for no-fractional-precision, 4 for no + on positive values, 8 for always show two digits of precision. maxlen specifies max length of total string. tcp_vol_zeroline AABBGGRR ; sets the ABGR value of the tcp's volume fader zero line. FFFF0000 would be solid blue, for example (v2.0+) -- note that this used to be documented incorrectly. REAPER will load images, from the list below. Most images can have sizing metadata included in the form of pink (RGB(255,0,255)) and/or yellow (RGB(255,255,0)) lines on the upper-left and lower-right corners. 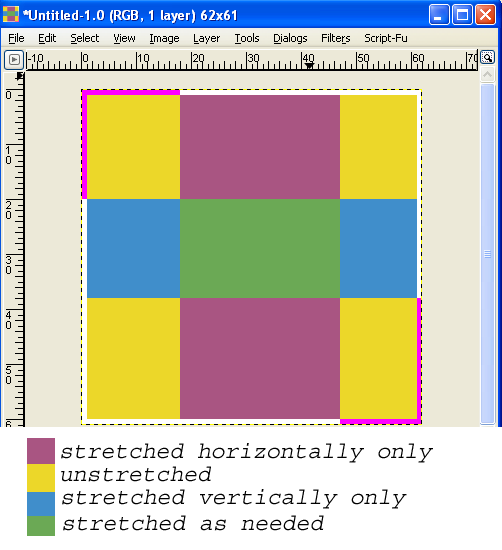 bg: an image with optional pink lines defining unscaled areas, and optional yellow lines for outer extent. sliced-button: 3-slice image (left to right) of button images (normal, mouseover, pressed). Can include pink lines for edge scaling. Can also have overlay image (imagename_ol.png), if enabled in rtconfig.txt, which includes pink lines to define outer extent. Normally these images will be a multiple of 3 in width (since there are 3 sub-imageas). You can also use pink lines similar to the background image, in which case the width will be 2 pixels greater than a multiple of 3. If use_overlays is set to 1, overlay images will also be loaded if found for buttons. Overlay images are useful for drawing shadows or highlights of buttons, typically outside of the button (and inside if you want it to interact nicely with other shadows as well). These images are named image_name_ol.png (i.e. track_mute_off_ol.png). These images will typically be mostly transparent, and are similar in format to the normal button image, except they should have pink lines in the upper left and lower right corners to delimit the area that would be outside of the button region. Overlays can also include yellow with their pink, in which case the yellow defines the outer area, and the pink defines the stretch region. knob-stack: an image that is used as a knob stack. The image is treated as a group of image slices, spread along the larger dimension of the image. If the image has no pink corner lines, the smaller dimension is used as the slice size. The image will be drawn square (and centered in the knob area if needed). If the image has pink lines only, the pink line on the top or left (depending on the axis of the slices) define the slice size, allowing for non-square slices. The image will be drawn with aspect ratio preserved in the knob area. If the image has yellow lines in addition to pink lines, the yellow lines define the outside area, where the image is drawn according to the above logic, but with an outer extent region as specified by the yellow pixels. 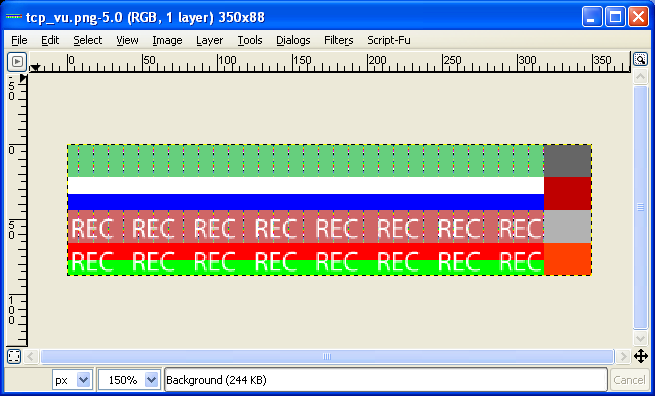 Note that yellow pixels being used require a certain amount of pink to signify that the logic should be active. Finally, in the instance where there are tcp_knob_stack and tcp_knob_stack_1 etc, the image used will be selected from from these images based on aspect ratio and size. These images form the lit and unlit states of each of the VU meters. You can also have them function as a mask over the default meters by using the alpha channel (i.e. transparency = stock meter). A tutorial for scrollbar skinning is available here. 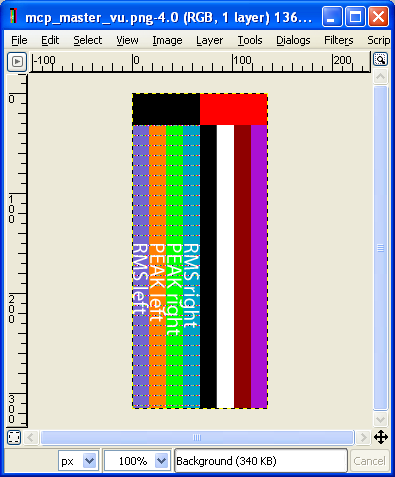 This image contains all the scrollbar elements. It needs to have a dimension of 204x238px. The pink (RGB color: 255,0,255) sections determines how each slice will be stretched. The areas delimited by the pink color will not be stretched. 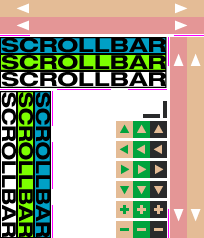 The horizontal scrollbar has 2 pink areas defined on line 35, one for each side of the scrollbar. 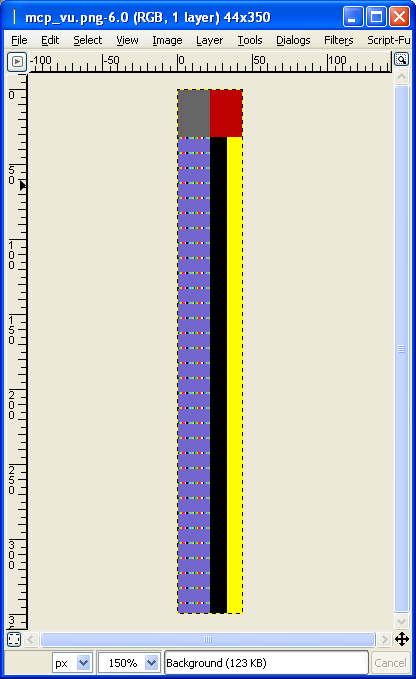 The vertical scrollbar has 2 pink areas defined on column 168, one for each side of the scrollbar. The horizontal thumb has 3 pink areas defined on line 89: left, middle and right sides. The vertical thumb has 3 pink areas defined on column 52: top, middle and bottom sides. Each button is 17x17px and has 3 states: off, mouseover, pushed. The following images can be used to customize the appearance of the extended mixer views. Alphachannel is supported on all of these. Per-slot button images. These are all three slices of equal height, arranged vertically (top slice being normal, second being mouseover, and third is pressed). Note that panel background stretch isn't currently supported. If not found, falls back to track_env. If not found, falls back to track_env_read. If not found, falls back to track_env_touch. If not found, falls back to track_env_write. If not found, falls back to track_env_latch. If not found, falls back to track_mute_on. If not found, falls back to transport_end. If not found, falls back to transport_home. If not found, falls back to mcp_arrowbuttons_lr. If not found, falls back to mcp_arrowbuttons_ud. If not found, falls back to mcp_fxparm_arrows. If not found, falls back to mcp_fxparm_knob_bg. If not found, falls back to mcp_fxparm_knob_stack. If not found, falls back to tcp_iconbg. If not found, falls back to tcp_iconbgsel. If not found, falls back to tcp_pan_label. If not found, falls back to tcp_vol_label. If not found, falls back to tcp_wid_label. If not found, falls back to gen_knob_bg_large. If not found, falls back to gen_knob_bg_small. If not found, falls back to tcp_vol_knob_stack. If not found, falls back to tcp_vol_knob_stack_1. If not found, falls back to tcp_vol_knob_stack_2. If not found, falls back to knob_stack. If not found, falls back to knob_stack_1. If not found, falls back to knob_stack_2. If not found, falls back to mcp_volbg. If not found, falls back to mcp_volthumb. If not found, falls back to tcp_panbg. If not found, falls back to tcp_panbg_vert. If not found, falls back to tcp_panthumb. If not found, falls back to tcp_panthumb_vert. If not found, falls back to track_fx_norm. If not found, falls back to track_fx_empty. If not found, falls back to track_recarm_on. If not found, falls back to toolbar_snap_off. If not found, falls back to toolbar_snap_on. If not found, falls back to mcp_extmixbg. If not found, falls back to mcp_extmixbgsel. If not found, falls back to track_fx_dis. If not found, falls back to mcp_fx_norm. If not found, falls back to mcp_fx_empty. If not found, falls back to mcp_fxlist_arrows. If not found, falls back to mcp_send_knob_stack. If not found, falls back to mcp_iconbg. If not found, falls back to mcp_iconbgsel. If not found, falls back to mcp_fxlist_bg. If not found, falls back to mcp_fxlist_byp. If not found, falls back to mcp_fxlist_empty. If not found, falls back to mcp_fxlist_norm. If not found, falls back to mcp_fxlist_off. If not found, falls back to mcp_pan_label. If not found, falls back to mcp_sendlist_arrows. If not found, falls back to mcp_sendlist_bg. If not found, falls back to mcp_sendlist_empty. If not found, falls back to mcp_sendlist_knob. If not found, falls back to mcp_sendlist_meter. If not found, falls back to mcp_sendlist_mute. If not found, falls back to mcp_sendlist_norm. If not found, falls back to mcp_vol_label. If not found, falls back to mcp_wid_label. If not found, falls back to track_monitor_off. If not found, falls back to track_monitor_on. If not found, falls back to track_monitor_auto. If not found, falls back to track_stereo. If not found, falls back to track_mono. If not found, falls back to track_mute_off. If not found, falls back to tcp_pan_knob_large. If not found, falls back to tcp_pan_knob_small. If not found, falls back to tcp_pan_knob_stack. If not found, falls back to tcp_pan_knob_stack_1. If not found, falls back to tcp_pan_knob_stack_2. If not found, falls back to track_phase_norm. If not found, falls back to track_phase_inv. If not found, falls back to track_recarm_off. If not found, falls back to track_recarm_auto. If not found, falls back to track_recarm_auto_on. If not found, falls back to tcp_recinput. If not found, falls back to track_recmode_in. If not found, falls back to track_recmode_out. If not found, falls back to track_recmode_off. If not found, falls back to track_solo_off. If not found, falls back to track_solo_on. If not found, falls back to tcp_vol_knob_large. If not found, falls back to tcp_vol_knob_small. If not found, falls back to tcp_volbg. If not found, falls back to tcp_volthumb. If not found, falls back to tcp_width_knob_large. If not found, falls back to tcp_width_knob_small. If not found, falls back to tcp_wid_knob_stack. If not found, falls back to tcp_wid_knob_stack_1. If not found, falls back to tcp_wid_knob_stack_2. If not found, falls back to mcp_panbg. If not found, falls back to mcp_panbg_vert. If not found, falls back to mcp_panthumb. If not found, falls back to mcp_panthumb_vert. If not found, falls back to meter_bg_mcp. If not found, falls back to meter_clip_v. If not found, falls back to meter_ol_mcp. If not found, falls back to meter_strip_v. If not found, falls back to track_io. If not found, falls back to transport_pause. If not found, falls back to transport_pause_on. If not found, falls back to transport_play. If not found, falls back to transport_play_on. If not found, falls back to transport_repeat_off. If not found, falls back to transport_repeat_on. If not found, falls back to transport_stop. If not found, falls back to scrollbar. If not found, falls back to tcp_bg. If not found, falls back to tcp_bgsel. If not found, falls back to envcp_learn. If not found, falls back to tcp_namebg. If not found, falls back to envcp_parammod.